On this day, the enemy viciously attacked me. On this day, I solidified my commitment to God. Attending She Speaks 2017 forced me out of my comfort zone. God knows I am most comfortable at home, surrounded by my family, friends, and familiarity. I am most comfortable writing about my journey, praying I will encourage others. Writing equals solitude. As July 20 grew close, nerves eclipsed confidence. But, I made it. I got on the plane. I flew solo to Charlotte, where I would walk into the conference on my own. Yes, I had made some contacts via the She Speaks Facebook page and these women provided a sense of comfort . . . but my underlying fear remained: rejection. Nothing could have prepared me for the emotions and sheer exhaustion experienced at this conference. The combination ripened me for an enemy attack. Silly me, I forgot to pray my very important verse on rest (Matthew 11:28) while at the conference! Fatigue overwhelmed me as I walked into the final workshop. In this interactive class, I collaborated with two other women to create a hook for a chapter in my book. We struggled through it together and fashioned a great hook (in my opinion). I realized in those moments the true nature of writing: it involves so much more than simply penning words on a page! The leader asked volunteers to share their work. I nervously glanced at my new friends and mouthed, “no way, not me.” Brave women raised their hands and read aloud their work. All the while, my heart nearly beat out of my chest. Do it, God commanded. “Nope,” I responded. My heart continued to pound and I knew I needed to obey. I half raised my hand, then slowly stood up to share the hook my group collectively crafted. Then, with a follow up question that forced me to get real with strangers and the sweet best-selling author leading the workshop, tears welled in my eyes and slowly slid down my cheeks. I remember the women commending my bravery. I remember the nice woman handing me tissues. I remember the kind smiles, the encouraging words. I remember the enemy viciously feeding me lies. These women are much more talented than you. Quit now; it’s going to be too difficult. The publisher will laugh when she sees your proposal. God has other women who will handle this job better than you. I checked out. I sat, listening to the other women continue to share, listening to the leader praise their efforts. Quietly, this battle raged in my head. I walked out of this workshop declaring my intention to quit. I believed the lies the enemy fed me. Let me take a second here to thank the women who encouraged me that evening. From the bottom of my heart, I am so grateful for your words. I can’t even name everyone because there were women lifting me up I hadn’t even previously met. And then, I listened – really listened – to the message Saturday night. Tears streamed down my face as God used the speaker to reach me. God spoke directly to the lies declared by the enemy. Yes, this is going to be hard. Yes, this will require you to go outside your comfort zone. I know where I am leading you, and I need you to trust Me. After the conference ended, I called my husband and relayed all that happened. I told him, “If I had known when God called me to write that it would be this hard, I wouldn’t have said yes.” And instantly, I felt God respond, “I know.” I did commit, though. I vowed to share my experiences and encourage other women. My lesson? On the calm plane ride home, God lovingly shared it with me: by continually stepping out of my comfort zone, I solidified my commitment to God’s call for me to write . . . even though I wanted to quit. God knows my heart. And so does the enemy. It explains the intensity of the attacks. God’s plans for me – and for you! – are so amazing, the enemy tries to knock us off the path the closer we get to aligning our lives with our Creator. God also spoke a verse to my heart: He must increase, and I must decrease. I had to look up the Biblical address for this piece of Scripture when I got home (John 3:30). I love the NIRV version that says “He must become more important. I must become less important.” The reason I believed the enemy that day is because my focus was on myself, not Him. I had no confidence in the beautiful way God would work out His plan. It wasn’t about how He could be glorified, but how I felt mortified. It’s not about my discomfort. It’s not about the way I write. It’s about Him. Praising Him. Turning others to Him. Encouraging other women to stop living a distracted life and start living a life focused on Him. Him. Him. Him. The truth? I can’t do this. Not on my own, anyway. Not without God. He will equip me for this call, and His vision will be fulfilled if I continue to walk in obedience. I challenge you to read John 3:30 in your Bibles. Read the story leading up to this beautiful truth. Meditate on it. 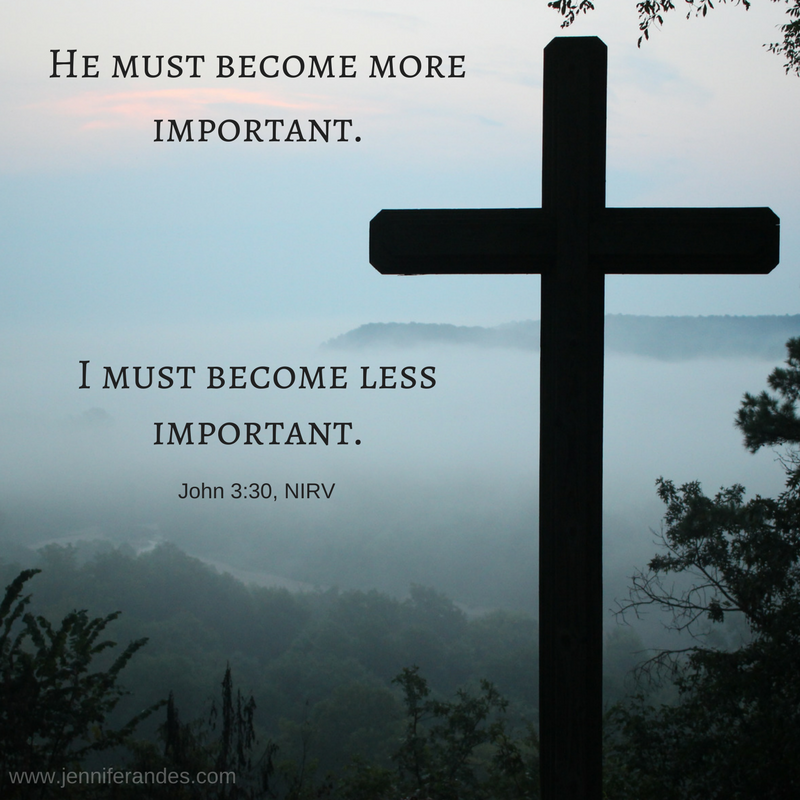 What simple changes can you make in your way of thinking or doing life to make Him the focus? Please share your thoughts, so we can be mutually encouraged! I’m so proud of you! I’m so glad you are choosing to believe what God has called you to do! Walk scared but keep walking! I love this verse! He must become more and we must become less! Keep reminding me of this 🙂 So glad God let us meet through She Speaks! It’ll be our writer’s mantra! Thanks for your vulnerable and eloquent words, Jennifer! I believe most of us can relate. Walking into a room of nearly 1,000 women can feel entirely overwhelming. Stepping into a calling is anything but comfortable. As we stood during worship, I surrendered so many similar thoughts, considering the cost of this calling. And I was surprised by how hard this calling is turning out to be. What happened to quietly writing on Wednesday afternoons from my recliner? But we will press on! I pray for you on this journey! God is so pleased with your sacrifice of praise! This is hard!! I am excited for the challenge, but I definitely feel like I am writing less and crafting my words more. It’s in God’s hands! Hi Ashley! Thank you for putting words to my jangled thoughts following the SS Conference! I don’t think there is one of us who hasn’t had doubts since we left NC! What a refreshing and inspiring reminder that we do this for Him, and only Him! Thank you for bravely sharing your experience to inspire us all to do His work! Thanks too for participating in my blog’s SS 2017 Link Up! Hope you’ve enjoyed peeking into all of our unique experiences! I’ve had a blast! Hope to see you at SS 2018! Blessings on your blogging journey! Hi Jennifer! I attended SS 2017, and I’m headed to SS 2018 next week. How about you? Was Suzie Eller leading the workshop you described in here? She and I have become personal friends, and she’s one of the most grace-filled women I know. I faced spiritual attacks before, during and after SS 2017, and it’s shaping up the same this year. You speak much wisdom in this post. I don’t know where you are on the publishing journey now, but I’m praying blessings on you today! Thank you so much for your kind words and prayers! Yes, it was Suzie Eller’s teaching and I learned so much from it. That workshop improved my writing immensely…and I still have a long way to go. I am sadly not attending SS this year. We’ve had a major move and I have not had much time to devote to writing. I’m hoping to start focusing on it again soon and begin following publisher’s advice! Congratulations to you on your book contract! I am praying for you and cheering you on!